TUCSON – A Mexican national and a Douglas man were arrested in two separate smuggling attempts at the Raul Hector Castro Port of Entry in Douglas. Officers referred a 25-year-old Agua Prieta, Sonora, Mexico, woman for further inspection of her Ford compact car after she attempted to enter the U.S. through the Port of Douglas this week, according to U.S. Customs and Border Protection (CBP). Officers searched the vehicle and found more than 30 packages of marijuana within the cars’ bumpers. The drugs, weighing more than 37 pounds, are estimated to be worth nearly $19,000. 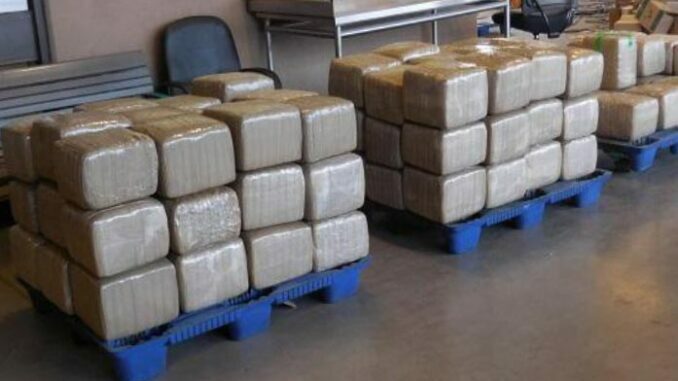 Also this week, officers at the Port’s Douglas, Arizona Commercial Facility referred a 49-year-old Douglas man for a further search of his trailer loaded with ceramic tile. Once a canine alerted to the trailer, officers examined the contents which determined to include 90 bundles of marijuana. The drugs weighed almost 1,155 pounds, with an estimated value of more than $577,600. personnel and expansion of ports-of-entry? And at the ports where container ships arrive? Albert, I think the better way to say that is”most drugs are caught” at the border check points. No one knows just how many get through via the non-checked points along the border.